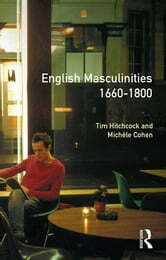 This collection of specially commissioned essays provides the first social history of masculinity in the ‘long eighteenth century’. Drawing on diaries, court records and prescriptive literature, it explores the different identities of late Stuart and Georgian men. The heterosexual fop, the homosexual, the polite gentleman, the blackguard, the man of religion, the reader of erotica and the violent aggressor are each examined here, and in the process a new and increasingly important field of historical enquiry is opened up to the non-specialist reader. The book opens with a substantial introduction by the Editors. This provides readers with a detailed context for the chapters which follow. The core of the book is divided into four main parts looking at sociability, virtue and friendship, violence, and sexuality. Within this framework each chapter forms a self-contained unit, with its own methodology, sources and argument. The chapters address issues such as the correlations between masculinity and Protestantism; masculinity, Englishness and taciturnity; and the impact of changing representations of homosexual desire on the social organisation of heterosexuality. Misogyny, James Boswell's self-presentation, the literary and metaphorical representation of the body, the roles of gossip and violence in men's lives, are each addressed in individual chapters. The volume is concluded by a wide-ranging synoptic essay by John Tosh, which sets a new agenda for the history of masculinity. An extensive guide to further reading is also provided. Designed for students, academics and the general reader alike, this collection of essays provides a wide-ranging and accessible framework within which to understand eighteenth-century men. Because of the variety of approaches and conclusions it contains, and because this is the first attempt to bring together a comprehensive set of writings on the social history of eighteenth-century masculinity, this volume does something quite new. It de-centres and problematises the male ‘standard’ and explores the complex and disparate masculinites enacted by the men of this period. This will be essential reading for anyone interested in eighteenth-century British social history.